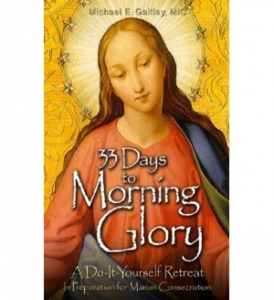 33 Days to Morning Glory is a do-it-yourself Marian Consecration retreat written by Father Michael Gaitley. His own conversion story contains a powerful witness to the many graces of Marian Consecration. The program can be done individually or in a small group. Each week of the retreat focuses on a different Marian “expert” and how they lived out their consecrations to Mary. These “experts” include: Saint Louis de Montfort, Saint Maximilian Kolbe, Blessed Mother Teresa and Blessed John Paul II. More information on this program will be availble after the 10:15 a.m. Mass on October 14. C.S. Lewis quotes are some of the very best for thinking and reflecting on faith. This is one of my favorites because it reminds me of how often I’ve searched for something that was in my path all along. Like when I can’t find my car keys and I rummage through every coat pocket, purse, and kitchen counter junk pile only to find that they’re right in front of me. I must have looked at them a dozen times but didn’t see them. And how in life, we walk along not really looking for anything in particular, and we stumble upon a treasure. And even though we’ve walked that same path a million times, and maybe even glanced that way, we never saw the treasure that was there all along. Over the past 33 days I’ve come to see something, or rather someone, who has been in my path for a very long time. Her name is Mary. I now know how hard she has tried to get my attention over the years and how so many distractions in the world, in my life, and in my heart have made me unable and even unwilling to really see her. She’s been there all along, gentle and peaceful; quietly calling my name. And even though I knew this, and I’d occasionally glance her way, I didn’t really see her with my whole heart. Like the words of C.S. Lewis, Mary’s story has been written across the whole world and perhaps in letters to large for some of us (like me) to see. Most of us know the woman Mary and the story of Christmas as it’s retold to us every year. She surrounds us in statues, stained glass windows, the recited words of the rosary, and beloved hymns. But do we see Mary? Do we know her? Do we know her heart? Many Catholics have a special devotion to Mary but I never quite understood it myself perhaps because of my Lutheran upbringing and the Protestant influences in my life. To me, Mary was no doubt a great woman of faith who answered a brave call and fulfilled God’s plan for a Savior, but beyond that I never thought much more about her. I remember the first time I really began to notice Mary. It was Advent season, 1999 and I was 8 months pregnant with our son. I was moved to tears as I sat through Mass, one hand on my belly, gazing up at a statue of Mary. She was a mother and soon we would welcome her son. I too was a mother and would soon welcome my own son. I felt her call my name in that quiet moment of our shared maternal love. Thirteen years later I’m finally getting to know Mary. It’s funny how things find you and tug at your heart sometimes; things you have neglected or set aside at one time or another even if you did see them. Because seeing is not always believing unless we see with the eyes of our soul and open our hearts with faith and trust to be changed by what we see. I saw Mary so many times over the years and heard her voice, but I never fully opened my heart to her. 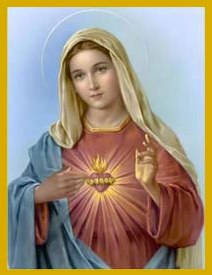 By truly getting to know Mary’s heart, I’ve grown in a deeper understanding and more intimate relationship with her and her Son. Like any relationship this has required a lot of communication and work. I allowed myself to be led by her through a beautiful 33 day study of her life with scripture readings and teachings from great Saints, daily prayers, and journal writing to unite my heart with hers. Who is this Mary? She is your mother. She is my mother. She is the spouse of the Holy Spirit and bearer of great graces for us all. The more we belong to her, the more she can unite us with her Son and use us to accomplish God’s most perfect will. John Paul says “Mary is the discreet yet subtle presence.” Her spiritual motherhood is deeply connected with the Church and with all of us as members. She is waiting and wanting to walk the path of life with each and every one of us and lead us deeper into the merciful heart of her Jesus. She calls to us in her quiet ways but it’s up to us to answer. John Paul goes on to say, “Even when the same woman is the mother of many children, her personal relationship with each one of them is of the very essence of motherhood.” Mary is personally a mother to us all, and she doesn’t lose us in the crowd even though we may lose sight of her. On October 14 at the 10:15 a.m. Mass, thirteen women at St. Anne will conclude their 33 day study of Marian teachings and will consecrate themselves to her in faithful service, entrustment, and devotion. I’m blessed to be among them and so grateful that I finally answered this gentle woman who has whispered my name for so very long, waiting patiently for me to walk with her.